Last edited by peadya100 on Fri Jan 11, 2019 2:11 pm, edited 317 times in total. Here's a few pics of how it stood stock after its bath. 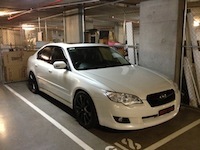 Its had the paintless dent removal, been cleaned, polished & waxed. with the new wheels on it. Last edited by peadya100 on Tue Apr 07, 2015 11:10 am, edited 7 times in total. just a quick question what leather cleaner did you use?? my interior needs some loving and looking for the right leather conditioner. I used an Autoglym leather cleaner. Not the cheapest around, but i have their polish and wax and knew they made good stuff. Ive never owned leather seats before so i couldnt tell you whether or not its any better than the merguiars or other common brands.. but id imagine the merguiars stuff you can buy at supercheap would be pretty good. Your Lib looks brand new. Looks exactly like my Lib but shinier. Looking forward to seeing your first dyno tune and posts. Im looking forward to the dyno too as it should get me a very noticable gain with the exhaust and intake being installed at the same time. Fingers crossed I get similar figures to your first tune. - The front passanger door lining was very badly damaged (see photo), i picked up a new one of those in mint condition from a wrecker for $100. However, very gorgeous car mate! The door lining I got from the wrecker is amazing.. it is like new. You can probably find them a bit cheaper than $100 if youre willing to call around. Keep an eye out for people wrecking their cars on the forum too. 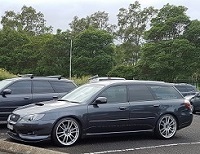 This is a really neat looking wagon. Welcome to the forums. 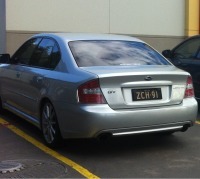 Keen to see what power you get once you get your exhaust and tune done. So shiny! Nice work Adam, looks tops. Next step is to make it faster.